Welcome to the Electronic Worship Assistant Sign-up for University Lutheran Church. Below are brief descriptions of the responsibilities of the various worship assistant roles. If you have questions, please contact the office or one of the vergers, and we will be happy to provide more information. We hope you will prayerfully discern how you are being called to use your God-given gifts to contribute to the worship life of our faith community. Ushers help greet worshippers and hand out worship material, control traffic, maintain order, collect offerings and help present the gifts, and assist with the unexpected. Ushers report to serve by 10:00 a.m.
Greeters greet worshippers, especially folks who may be new, and help hand out worship material before the service; after the service greet visitors as they leave, collect Connection Cards, and distribute hand-outs. The Crucifer carries the processional cross into the sanctuary, leading the entrance procession, the Gospel procession, and the recessional. The Deacon assists the presider in leading the the creed and prayers, sets the table for Eucharist, administers the chalice during Eucharist, and sends the assembly at the end of worship. When there is no Sub-deacon, the Deacon takes on those functions as well. The Sub-deacon holds the missal during the Prayer of the Day, holds the processional Bible during the Gospel reading, helps set the table for Eucharist, and administers the pouring chalice during Eucharist. The Lectors read the First (usually Old Testament) and Second (Epistle) Readings to the assembly. By coming forward from the congregation and returning to their seat afterward, they help emphasize participation of the laity in worship. The Prayer Leader offers prayers on behalf of the congregation conveying to God our lament, our hope, and our thanksgiving as we pray for the whole church, the nations, those in need, the congregation, and the faithful departed. 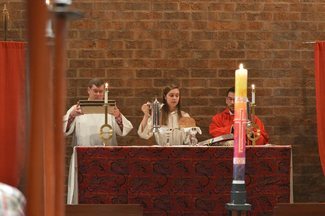 The Communion Assistant brings the bread used for communion, helps present the gifts, and administers the chalice during Eucharist, serving as a reminder that the whole church, not just the clergy, participate in the celebration of the Lord’s Supper. Healing Ministers offer prayers and laying on of hands at the Baptismal Font for those who need healing and wholeness during Eucharist on specific Sundays. Lay Eucharistic Ministers take communion to the housebound after worship to maintain their connectedness to the community. Fellowship Hour Hosts offer hospitality of food and beverage after worship. Individuals, couples, or groups may join together to host and clean-up afterwards. Linen Launderers wash and iron the sacramental linens used during worship. Vergers oversee all of the above positions, as well as set-up and clean-up the Sanctuary for worship. Vergers find substitute worship assistants when necessary, are responsible for the security of the building during worship, and anticipate the unexpected throughout. Please bring a loaf of bread for Communion.